Hard to even begin to scratch the surface in the aftermath of that game. I want to just put it in bold lettering so that it’s easy to read, even if it’s not easy to comprehend for Auburn fans who’ve suffered through years of terrible basketball. 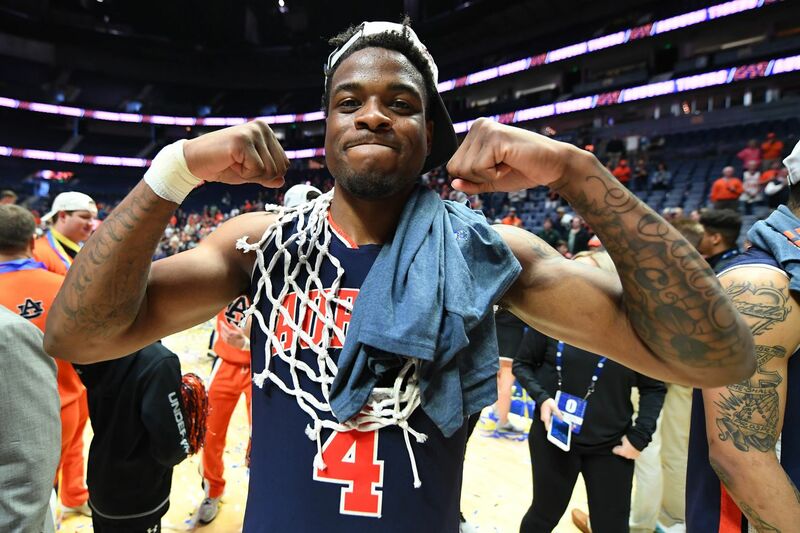 AUBURN WON THE SEC TOURNAMENT CHAMPIONSHIP BY BEATING TENNESSEE BY 20 POINTS AND WILL HANG A SECOND BANNER IN TWO YEARS. BRUCE PEARL IS A GOD. That’s it. Read that over and over while enjoying these highlights from yesterday’s incredible blowout. Man. What a victory. After the sweat-filled wins from the first three days of the tournament (10 points, 9 points, 3 points) yesterday was almost anticlimactic. It was cathartic. It was one of those rare occasions that Auburn just blows somebody away and there’s very little doubt that it’s just the Tigers’ day. Once again, just like the first three days, the reason that Auburn was able to do what it did started with defense. The nation’s top turnover-forcing team frazzled Tennessee into 17 more mistakes yesterday after doing the same to Missouri, South Carolina, and Florida. The main difference in the championship game is that the Vols weren’t hitting 70% of the shots they did take like those other teams did. They weren’t making buckets like we saw last weekend at Auburn Arena. And on the flip side, Auburn finally was. Now, the first half was just an appetizer in terms of the offensive explosion, as Auburn only scored 32 points, shot 34%, and went 5-20 from deep. It was actually pretty on par with what they’d done in the first three games of the tournament, scoring in the 30s. It was just such a stark contrast to Tennessee’s offense. The Vols scored two buckets in the final ten minutes of the first half, turned it over on seven straight possessions, and allowed Auburn to go on a 16-0 run. Auburn turned an 18-15 deficit into a 31-15 lead, and the advantage only teetered on single digits for a brief moment after halftime before the doors blew off. And you know what the most impressive stat about that first half might be? Our floor general got saddled with two early fouls and had to ride the bench for the final 17:39 of the half. Enter J’Von McCormick. I was nervous. That’s probably a sentiment that was shared by many Auburn fans yesterday, but we forgot to have faith in Bruce Pearl’s plan. Remember early in the year (and actually not all that long ago) when McCormick was a liability running the offense? Jared Harper’s standard first half rest period usually coincided with an offensive slump and increased turnovers because McCormick was in charge. That wasn’t the issue yesterday. He dished out 3 assists, scored 5 points, and made a huge momentum three to get things going for the Tigers during the big run. It was so critical, and when the second half began, Tennessee was tasked with worrying about an extremely-rested Jared Harper. Along with Chuma Okeke and Tournament MVP Bryce Brown, that was just too much to handle. Throw in a motivated Danjel Purifoy and a Malik Dunbar made of rubber, and you’ve got the ingredients for an embarrassing blowout. It was astonishing watching Auburn destroy Tennessee in the second half by way of the three ball. Auburn hit 10-20 bombs, but it seemed like much more. Every time the Vols made a little run, somebody answered with a huge three. Everybody ate yesterday. I also want to commend Bruce Pearl for his perfect sense of when to throw Austin Wiley in the game. He only played a few minutes in each of the last three contests, but he was the spark that either cued an Auburn spurt, or kept the pedal down. In the end, we were too much for Tennessee. With two wins over the Vols in an eight-day span, there’s no doubt that Auburn’s a better team. And anyone that thought last weekend’s win might have been tainted by that tip-in, I point to yesterday’s game. Tennessee was more rested, and got rolled. Auburn played its best game in its fourth game in four days. That’s the result of incredible motivation, which is only part of the Bruce Pearl factor on the Plains. 4 wins in 4 days. Now, for the Vols, does this cause a little introspection? Rick Barnes was let go at Texas not because the Longhorns weren’t winning, but because they weren’t topping the mountain. Barnes won three regular season titles in Austin (1999, 2006, 2008), and went to a Final Four and two Elite Eights. He won over 400 games in 17 seasons, but there were a ton of early exits from the NCAA Tournament, and no Big 12 Tournament championships. Texas wanted titles, and Barnes was getting close, but not quite there. Tennessee may lose a couple of their key cogs after this season and have to rebuild some more. Schofield’s a senior, while Grant Williams could certainly jump to the NBA Draft, and there are other juniors who may test the waters as well. We’ll see how they handle this. As for Auburn, it’s just unfamiliar, but welcome, territory. We’re going to add another championship banner at the Arena, and we’re in a great position for next year with the talent that we’ll hopefully be bringing back and bringing in. But this year’s not done yet. If the Tigers play like they did yesterday, there’s a high, high chance that we’re seeing them against North Carolina next weekend in Kansas City. New Mexico State and Kansas will be tough, but Auburn’s playing the best basketball of the season right now, and I don’t know if there’s a more confident team in the country. Enjoy it, everyone. This is all just starting. War Eagle!